al-Kabīr which means 'The Great' - the 37th name of God in Islam. Apart from having an important influence on Sikhism, Kabir's legacy is today carried forward by the Kabir Panth ("Path of Kabir"), a religious community that recognizes him as its founder and is one of the Sant Mat sects. Its members, known as Kabir panthis, are estimated to be around 9,600,000. They are spread over north and central India, as well as dispersed with the Indian diaspora across the world, up from 843,171 in the 1901 census. His writings include Bijak, Sakhi Granth, Kabir Granthawali and Anurag Sagar. Kabir composed in a pithy and earthy style, replete with surprise and inventive imagery. His poems resonate with praise for the true guru who reveals the divine through direct experience, and denounce more usual ways of attempting god-union such as chanting, austerities, etc. 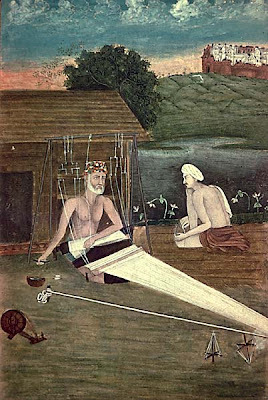 Kabir, being illiterate, expressed his poems orally in vernacular Hindi, borrowing from various dialects including Avadhi, Braj, and Bhojpuri. His verses often began with some strongly worded insult to get the attention of passers-by. Kabir has enjoyed a revival of popularity over the past half century as arguably the most accessible and understandable of the Indian saints, with a special influence over spiritual traditions such as those of Sant Mat, Garib Das and Radha Soami.
. WKD : Lotus (padma) . Hermit, nature has unnatural ways.
. WKD : Sandalwood (chandan) . A journey in search of the “des” (country) invoked in the poetry of the 15th century mystic poet of north India - Kabir - this film interweaves the stories of two people from two very different countries, Indian folk singer Prahlad Tipanya and North American scholar Linda Hess. The answer is elusive, as we journey through song and poem into these two lives, brought together in an unlikely friendship by the cross-cultural resonance of Kabir.